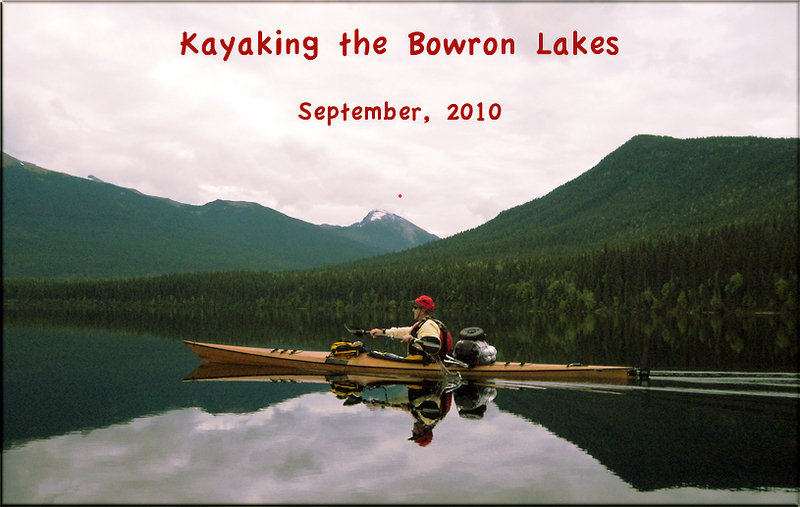 For several years I had heard about Bowron Lake Provincial Park, in central British Columbia, and the interesting chain of 8 lakes which could be paddled in a week to ten days. Ron Oberst took the initiative and made reservations for four and invited me to join a group from our "Hole in the Wall" kayak club to do the circut. In the end, Ron had to drop out because of family medical issues, but on September 9, Dan Yost, Rembrandt Smith and I, Don Webster, started the drive from Washington state up to the park. A friend had advised that the drive was scenic and to take more than one day for the drive so as to allow time for photography and to enjoy the views, so we allowed a day and a half to do the 600 miles. We entered British Columbia at Abbotsford, and took Hwy 1 up the broad Fraser Valley. This fertile delta of the Fraser River, supports agriculture of all kinds as well as dairy farms and considerable industry. The Fraser River itself was having one of the best runs of Sockeye Salmon in years, and we saw numerous fly fisherman taking advantage of the plentiful fish. As we moved up through the Coast Mountains, the river pinched into a narrower channel, and the farms stood on bluffs above the river. The mountains created micro-climates, and eventually the green grasses and vineyards gave way to drier grasslands and horse ranches. 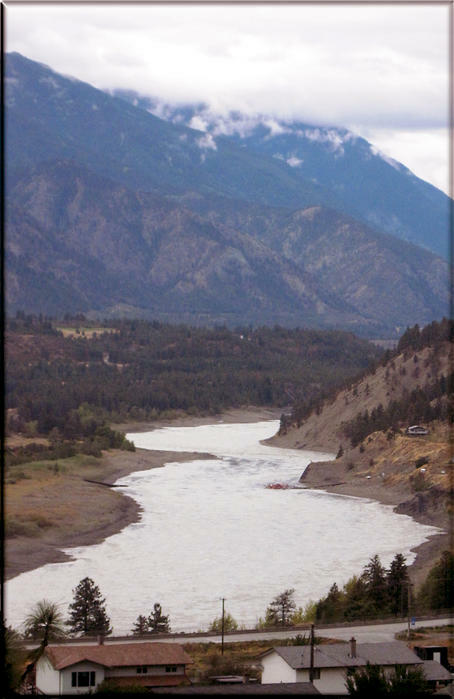 We were to follow the Fraser River off and on for most of our journey, and would enjoy the many lakes, rapids and diverse vistas that it would provide. 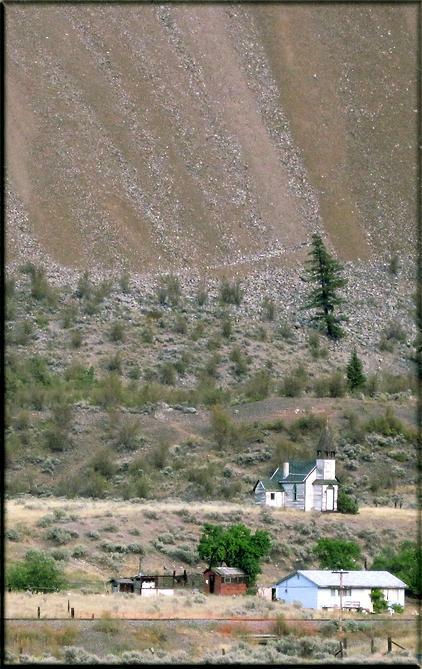 A church in ranch country on the Fraser River. 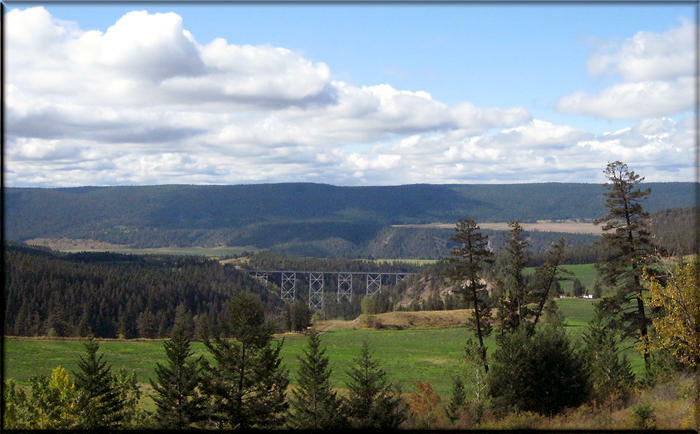 A railroad bridge north of Williams Lake. The paved road ended at Wells, BC. 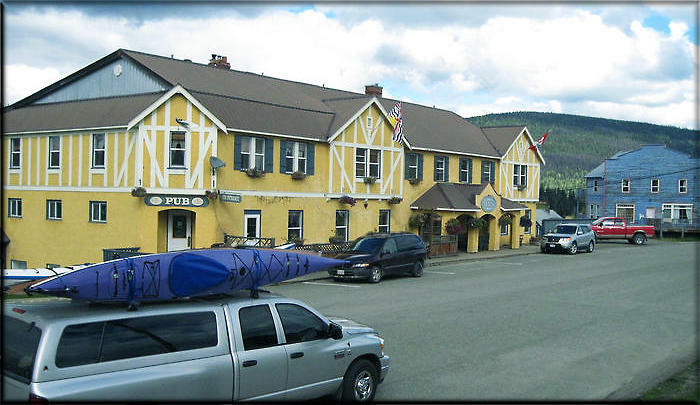 Wells was a thriving mining and logging town, now trying to retain its ambiance for the tourist trade. 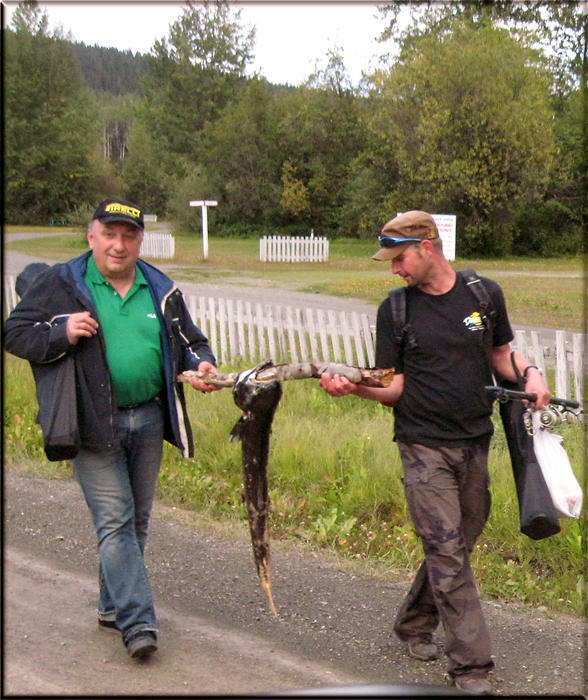 As we drove into the Bowron Lake Provincial Park, we passed these two fishermen with a beat up King salmon. It had travelled 600 miles up the fresh water of the Fraser River to spawn.